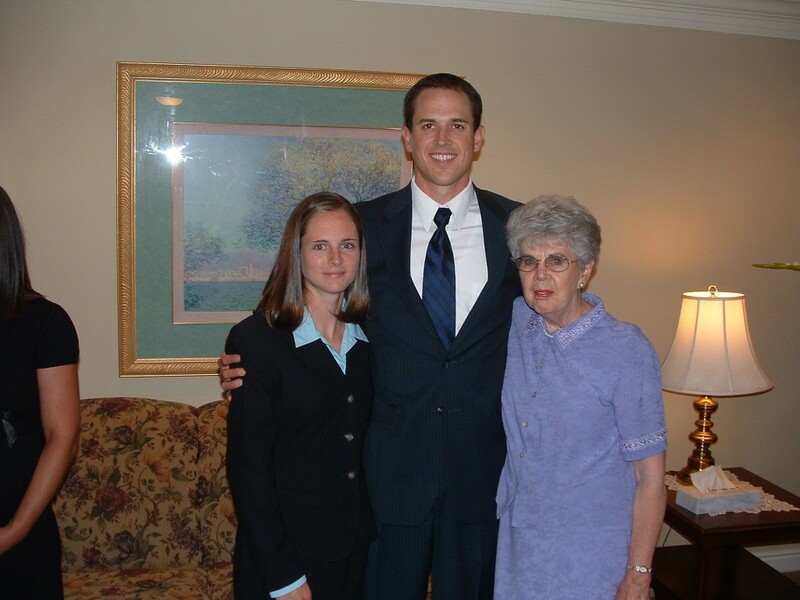 On Sunday afternoon I spoke to my Grandma Morgan for the last time. Mom held the phone to her ear as I told her how much I love her and what a positive influence she has been on my life. I told her to give Grandpa Morgan a big hug for me when she got to the other side. Thirty minutes later, Grandma passed away. She was 88 years old. My Grandpa Morgan preceded Grandma in death by nearly 30 years. I can’t even begin to count the hundreds of times throughout the years Grandma has expressed her loneliness and desire to see Bob again. When my brother, David called to tell me Grandma had passed away my eyes swelled with tears as I imagined the joyous reunion between Grandma and Grandpa taking place at that very moment. 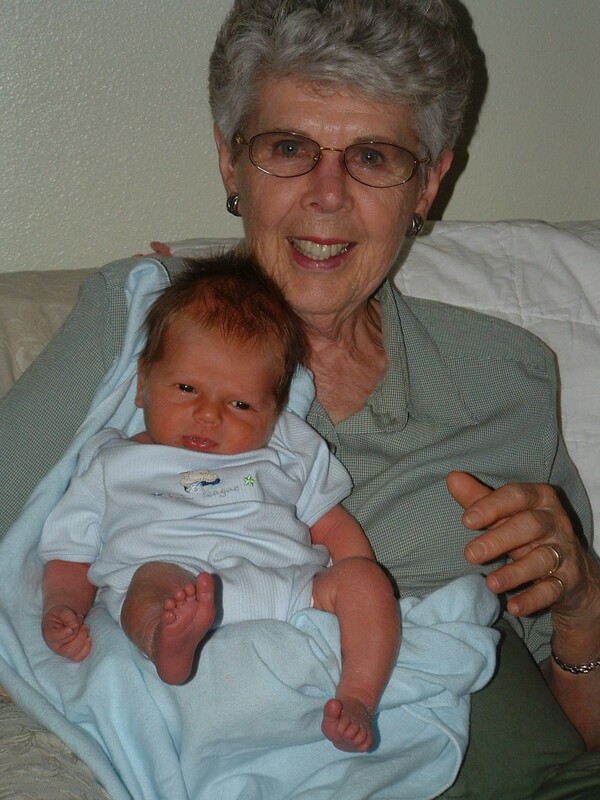 I was eleven months old when my Grandfather died and Grandma said I was always so cuddly and willing to hug her as long as she needed while she was mourning his loss. She became a widow so young, still in her 50s. All those hugs to Grandma when I was an infant must have bonded me to her because I have always felt a closeness to her. Grandma was a big part of our lives growing up. She lived close to us and watched us when Mom was in the hospital, requiring that we all work hard to clean the house before Mom got home. She also took us out for ice cream on special occasions, helped us can peaches, pears, jam, and applesauce in the Fall, took us on fun outings, supported us in school choir concerts or sporting events, and began feeling like an immediate member of our family. 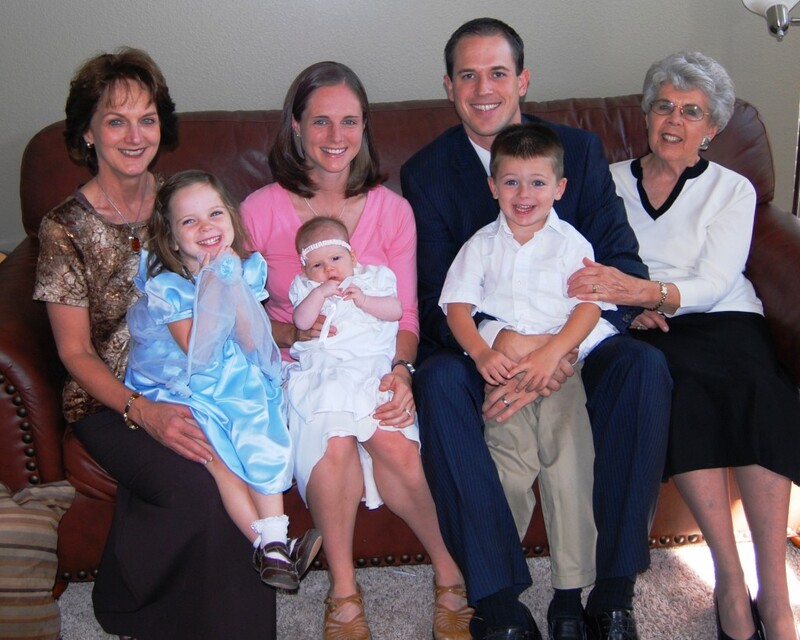 Grandma more often than not joined in on Sunday dinner gatherings, campfire dinners in Mueller Park canyon, water skiing at Pineview Reservoir, camping in Yellowstone, and of course visiting Brigham City for “Peach Days” and stopping by to visit Grandpa Morgan’s grave afterwards. 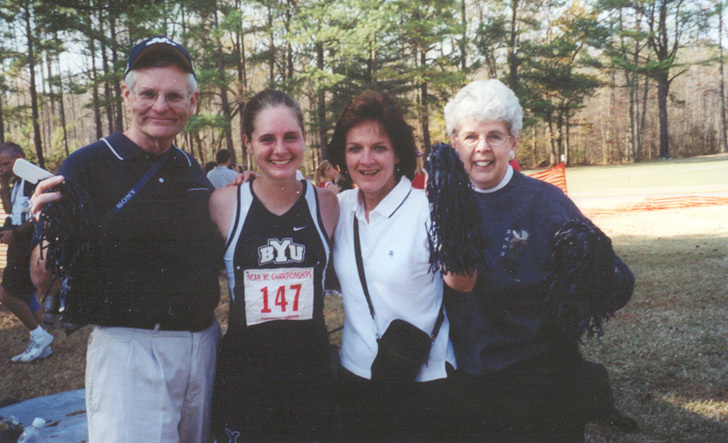 Even after I went to BYU, Grandma came with my parents to the NCAA Championships in Furman, SC to cheer our team on to first place. NCAA Cross Country Championships, 2001. 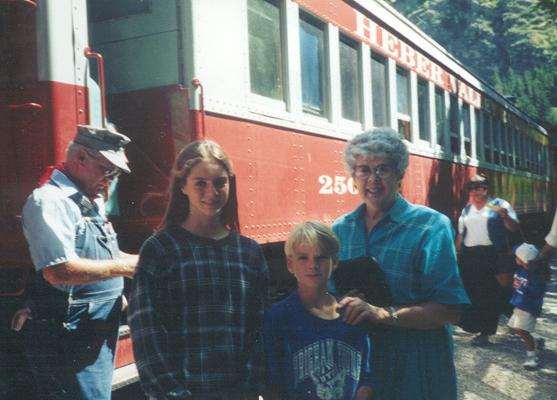 Dave, Grandma and I going on the Heber Creeper train through Provo Canyon in, I’m guessing 1992. 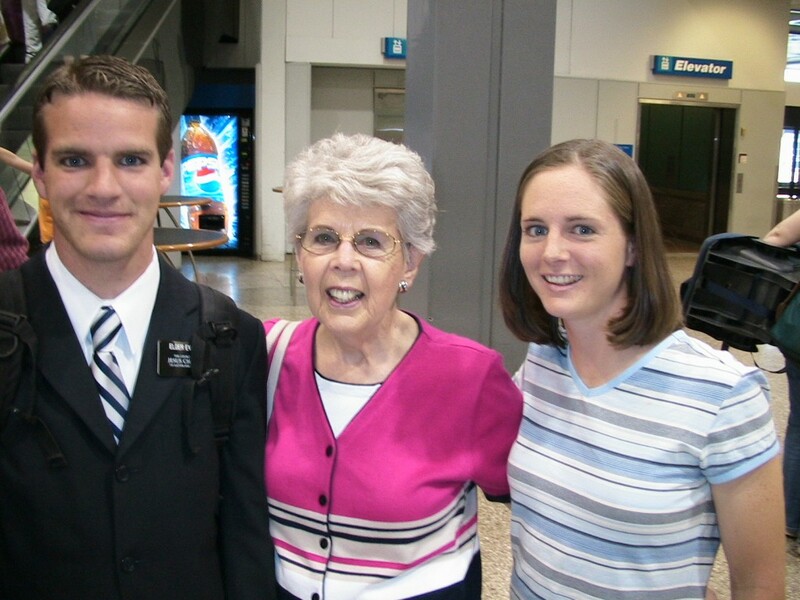 Dave returning from his mission 2005. Gramdma not only supported us by being there, she was a wise counselor, a friend and listening ear, and someone to laugh with. She taught us by example how to work hard, save our money, serve selflessly, listen compassionately, follow through with our commitments, laugh, and enjoy life. She always used to tell me a phrase that she and Grandpa Morgan wholeheartedly believe, “It doesn’t matter how many times you fall down, its how many times you get up and try again that count.” She exhibited perseverance and faith in everything she did. She was generous and enjoyed treating people to nice things and fun memories. I often remember she and Mom bickering about who was to pay the bill for dinner at a restaurant for special occasions and Grandma always won. Grandma was a joy to have around. I never once remember being bothered by her or having disagreements with her. She was easy to love and fun to spend time with. 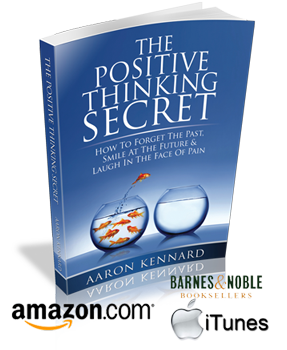 Without stepping on toes and only when appropriate, she humbly offered sound advice and faith-filled experiences. She and my Dad had a great relationship and Dad said he lucked out to get the best mother-in-law there was. I suspect she and Dad have had the chance to reunite since Sunday as well. Grandma lived a full and wonderful life and as much as I know I will miss her, I am grateful that she is relieved from her pain and infirmities and has passed on to the next phase. I am grateful for her influence in my life and I will do everything I can to tell my children about her and teach them the lessons she taught me. When Aaron and I went to visit Grandma in July she told us what a blessing my Mom has been to her. Mom has been Grandma’s greatest help and support through the past many years and especially as she required more help the past year. She was there for Grandma to help her through the last few months of frustrating memory loss, more and more dependence on others, moving into assisted living, selling her car and home, falling and having to recover from falls, requiring a walker and sometimes a wheelchair, and most importantly, needing a friend to be there and support her through life’s challenges and changes as she closed out the final chapter of her life. After Grandma fell one last time on Saturday night, Mom stayed with her all night to make sure she was comfortable and safe. Later on Sunday, Mom, Uncle John, Aunt Carma, and my brother Dave were there with Grandma as she took her last breath and they said it was very peaceful and serene as Grandma was received by loving arms back into the presence of those who have passed on before. I am looking forward to flying to Utah on Friday to celebrate her life with our family and remember together what a wonderful woman she is and how lucky we are to have been touched by her. God be with you ’till w meet agin, Grandma! We love you!